BioWare has released their latest video about Galactic Strongholds. 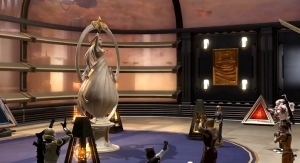 This video focuses on the Skyrise apartments on Coruscant. The 50 second clip showcases some of the same features we have seen in other Stronghold videos, multiple rooms, staircases, lots of furniture etc. Some things I noticed seeing in this video were vehicle mounts and in-game pets on display. Another thing was one of the frames saying, “Celebrate with Friends.” Does this suggest friends will have access to visiting your Stronghold? At this time we don’t know, but time will tell. Enjoy the video clip! Tell us what you thought of the trailer in the comment section below. To be honest I was disappointed that we did not see anyone sitting down in a chair. Is it that hard? @Merderlin That is a great observation. 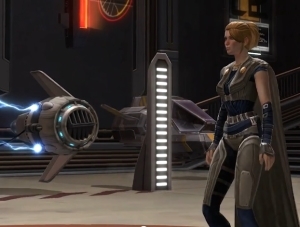 Chairs work in SWTOR, i.e. Captain’s chairs and emote chair, so I’m crossing my fingers this will be something to be revealed in an upcoming trailer or post from BioWare about Galactic Strongholds. Thanks again for the comment!